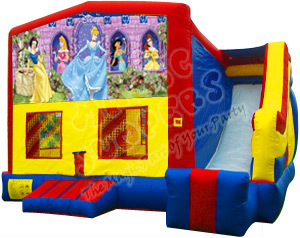 We from BounceHousesForRent.com will provide you with this new and clean Princess Theme Combo 1. Our price includes delivery, setup, and pickup within our delivery area. We serve parts of Los Angeles County and Orange County, California. Very cute! Great jumper and service. Very professional and on time. The kids loves it. Very clean. Will use this company again. They came promptly and quickly set up. Very good customer service, price, delivery timing, jumper condition. Kids had a great time. Will surely do business with you again and also recommend you to everyone!